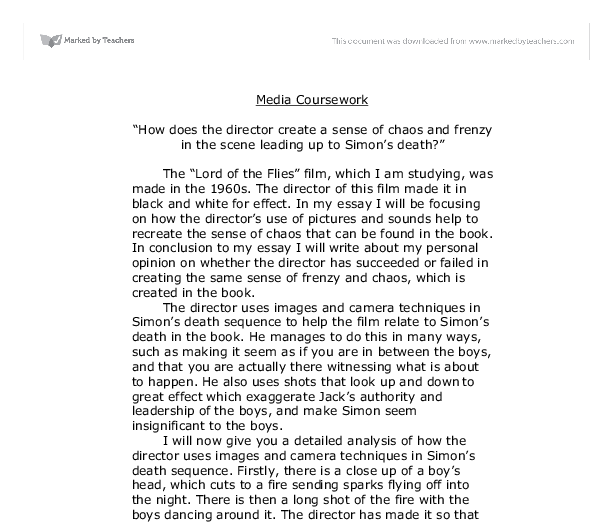 Media Coursework "How does the director create a sense of chaos and frenzy in the scene leading up to Simon's death?" 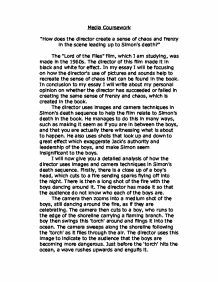 The "Lord of the Flies" film, which I am studying, was made in the 1960s. The director of this film made it in black and white for effect. In my essay I will be focusing on how the director's use of pictures and sounds help to recreate the sense of chaos that can be found in the book. In conclusion to my essay I will write about my personal opinion on whether the director has succeeded or failed in creating the same sense of frenzy and chaos, which is created in the book. The director uses images and camera techniques in Simon's death sequence to help the film relate to Simon's death in the book. He manages to do this in many ways, such as making it seem as if you are in between the boys, and that you are actually there witnessing what is about to happen. He also uses shots that look up and down to great effect which exaggerate Jack's authority and leadership of the boys, and make Simon seem insignificant to the boys. I will now give you a detailed analysis of how the director uses images and camera techniques in Simon's death sequence. Firstly, there is a close up of a boy's head, which cuts to a fire sending sparks flying off into the night. ...read more. There is a close up shot of Simon holding his arms up in terror This gives the audience the impression that they have rejoined the circle and are stabbing downwards at the 'beast' (Simon) along with the other boys. The camera then sweeps slowly along the beach, as the boys force Simon into the sea. We then see a shot of the tide coming into the shore; the sea water is mingled with Simon's blood. The camera then pans to Simon's body, floating in the ocean. His body starts off facing upwards and slowly revolves round to hide his face. The director uses this as a sign of respect for Simon that the audience can relate to. Meanwhile, the gentle tranquillity of the ocean helps to calm the audience after the chaos and frenzy of what has just happened. The screen slowly fades to total darkness with only a faint outline of Simon's body in sight. Finally the screen begins to get lighter as flickers of phosphorescent light can be seen here and there. This gradually overwhelms the screen and adds to the audience's sense of peace and tranquillity. I will now give a detailed analysis of the sounds used in the scene depicting Simon's death. The scene starts off with a high pitched scream and then, gradually, screaming from different people can be heard. This reflects the terror that the darkness brings in the novel. The crackling of the fire can be heard now, along with the continuous screaming of he boys. ...read more. The audience then hear short thuds and tearing. This leads them to the knowledge that the boys are brutally murdering Simon in a tide of chaos and frenzy. The high pitched screaming finally stops and the noise of the sea is heard in the background. Thunder can also be heard and there is a bloodthirsty repetition of "kill" by the boys. The noise of the boys slowly fades away which informs the audience that they are walking away from what they have just done. When the noise of the boys completely stops, the thunder and the sea can really be heard. There is then silence in the scene with faint and distant sounding choir music gradually getting louder. The choir music is harmonic and represents Simon's purity and innocence for the audience. Simon's death sequence ends with one clear, harmonic note from the choir that fades out slowly. In my opinion, the director of this film does create the chaos and frenzy within this scene as effectively as Golding does in the novel. The director's most successful part in this sequence is when Simon is killed and his body claimed by the sea. He recreates this part with the same natural and 'lyrical' beauty which Golding uses in the book. The director's only unsuccessful part in the sequence is the storm as he starts it too late in the sequence, whereas Golding uses the thunder and lightning to work the boys up into a frenzy. He also does not, in my view, successfully recreate Simon's death because no film could recreate the savagery of the boys and the imagery which Golding creates in the novel through his language and description. ...read more. to be lazy and it's really frustrating as we need to still need to go over the end scene. constantly haunted by the hollowness of everything he put his faith in..." And so if Biff had not confirmed what Willy had always known all along then maybe Willy might either still be alive or dies happily. However this point is very controversial. As Cole is saying this, the camera stays focused on Malcolm, trying to represent that Cole is talking about him. Camera technique is very important when trying to create suspense; unusual shots give the audience the impression that not everything is completely right. Bottom however would be dressed slightly differently. I would have Bottom in a suit, with a different jacket and trousers. I think this would convey his trait of his false sense of seniority. The other mechanicals, although wearing trousers and shirts, would wear brown, smocks/cloaks as no characters other than Bottom and Quince distinguishable from the group. "Whatever he wished. The choice was his not mine." showing Dionysus coming up with clever answers. Aural and Spatial (VAS), Interpretation and Vocal Awareness VAS The set was two chairs opposite each other, a table between them, centre stage ? a single spotlight, white, shines down on the table. Having entered the stage drunk, would wonder around before the light relieves the location of the Stepdaughter.